Louisville's defense made Wake Forest's passing game look great. Week 9 of the college football season provided a bunch of excitement and several upsets. Ohio State rallied to topple Penn State, Iowa State continued to surprise by defeating TCU, Georgia made winning look easy and Arizona quarterback Khalil Tate is the best late-night show in the sport. Here are 11 key numbers that stand out from the past weekend’s action. 44: Ohio State came from behind to beat Penn State, 39-38. Only two kick returns and an untimely turnover made it that close. Credit the units that struggled against Oklahoma. J.T. Barrett completed 33/39 (10/15 on throws 10-plus yards) for 328 yards and four touchdowns. The Buckeye defense restricted Penn State to just 4.42 yards/play. Ohio State had 13 tackles for loss and held Saquon Barkley to 44 rushing yards. Sad pizza seemed like it was in the offing early. The scoreline was close. But this effort was Ohio State living up to its No. 1 S&P+ ranking. 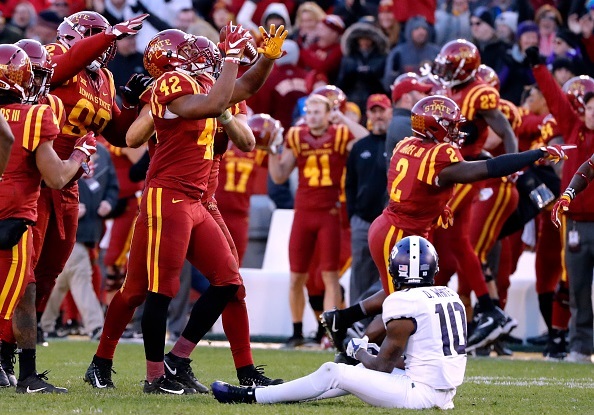 0: Iowa State upset TCU 14-7. Matt Campbell’s Cyclones, 4-1 in the Big 12, are tied for first. The Horned Frogs’ offense scored zero points. Iowa State has allowed only 13 points in its last three conference games combined. Winning the conference will be tough. Iowa State has three road games and a home game with Oklahoma State left. But the Cyclones are ranked for the first time since 2005. They look set for their first winning season since 2009. Getting to eight wins would be only the second time the program has done that since Earle Bruce left in 1978. 9.4: Georgia destroyed Florida 42-7, and that scoreline flattered the Gators. The Bulldogs’ efficiency startled. Georgia ran only 42 offensive plays, 35 of them rushes. They averaged 9.4 yards/play. Could we get two SEC teams in the College Football Playoff? If the Bulldogs beat Auburn on the road, it’s probable both SEC division champs enter that game undefeated. This sort of loss, on the losing end, can change the complexion of a season or a tenure. In three weeks, we went from “is Jim McElwain the long-term answer?” to Jim McElwain being fired. 6: Tennessee lost, 29-26, to Kentucky. Jarrett Guarantano completed 18/23, averaging 10.5 yards/attempt. Kentucky spotted the Vols four lost fumbles. How on earth did Butch Jones’s team lose? Well, giving up 8.0 yards/carry to Kentucky didn’t help. Nor did six drives inside the Kentucky 30 not resulting in a touchdown. That’s not counting the fitting Hail Mary for Tennessee caught short of the goalline. Tennessee did stem its offensive touchdown-less streak at 15 quarters. That has to be worth some leadership reps. The Vols are 0-5 in the SEC. They are 2-5 vs. FBS. Their biggest win was 17-13 over UMass. Florida was proactive. What is Tennessee waiting for? 3: Florida State’s season went off the rails, and then off a cliff. The Seminoles committed three turnovers and cobbled together three points in a 35-3 defeat at Boston College Friday night. BC’s 240-pound freshman A.J. Dillon ran for 149 yards and a touchdown on 33 carries. Steve Addazio’s dudes need just one win in their last three games to go bowling and have UConn on the schedule. FSU, after this loss, will likely be staying home. If you’re wondering what Jimbo Fisher should reevaluate after this result, it’s everything. 3.7: Bryce Love sat out Stanford’s Thursday night game in Corvallis. The Cardinal missed him. Stanford’s offense managed just 3.7 yards/play against Oregon State. They needed a late touchdown to slip away with a 15-14 win. The Cardinal finish to the season will be interesting. They face Washington State, Washington, Notre Dame, and a rivalry game against Cal. Oregon State has now strung together consecutive moral victories since Gary Andersen gave up $12 million guaranteed to get out of there. 607: Todd Graham is all about the high octane. Sometimes, that volatile brand of football catches on fire. Arizona State conceded 607 total yards to USC in a 48-17 drubbing in Tempe. USC’s 387 yards in the first half eclipsed their complete game totals against Cal, Washington State, and Notre Dame. The Sun Devils could not even intercept Sam Darnold. But rest assured. The Trojans QB did lose a fumble to keep his turnover streak alive at 10 games. 13.6: Wake Forest QB John Wolford completed 28/34 against Louisville for 461 yards and five touchdowns (four to freshman Greg Dortch) in Wake Forest’s 42-32 win. That’s an average of 13.6 yards/attempt. We’ve come a long way from Dave Clawson’s first two seasons, where the Demon Deacons scored three points in regulation combined in their two ACC wins. Louisville has now lost four of five against Power 5 teams. 813: Michigan State and Northwestern finishing 17-17 in regulation was a classic Big Ten result. The manner was anything but. Neither team could establish a running game. This game converted into an aerial battle. The Spartans and Wildcats combined for 107 attempts and 813 passing yards as Northwestern won 39-31 in overtime. 1,235: This box score was classic Mike Leach/Rich Rodriguez. Arizona and Washington State combined for 1,235 total yards and seven turnovers in the Wildcats’ 58-37 win. Khalil Tate, channeling Denard Robinson, posted 421 total yards and three touchdowns on just 30 touches. Washington State QBs threw the ball 84 times. It was great #Pac12AfterDark. The Pac-12 left much of the nation in the dark, airing the game on Pac-12 Network. 10: Judging from Saturday, one can just walk into Rentschler Field. Missouri crushed UConn 52-12. That win snapped the Tigers’ 10-game road losing streak. Their last road win came at Arkansas State in Sept. 2015. Half-full: Missouri has two wins on the trot. Half-empty: Missouri is 0-5 against Power 5 teams this season. The Tigers have lost 18 of their last 20 against them. Ty is a freelance writer/editor based outside Detroit. He's a Michigan Man. He enjoys dogs, whiskey, yoga, and composing pithy career summaries. Contact him at tyduffy@gmail.com.